7:30AM : Setup @ SOTA (transport from SFB) - we have been advised that gate may not be opened until 8:00am but hopefully it will be opened earlier. Attached is a satellite image of SOTA track. -- Parking - the image shows several areas where we can park on campus. There also is street parking on O'Shaughnessy Boulevard. -- Please do not park in either of two spots near the electrical outlet (bottom right corner of the image). These are reserved for Marius Ramos, who will be our walk-a-thon DJ/emcee and will be setting up on that corner above the track. -- Check In - We will set up by the top right corner of the track. That is where all walkers will check in before walking and spirit wear and 8th grade Root Beer Float Sales will be. -- Please NO FOOD OR DRINK on the track! -- All volunteers check in and out - to make sure you get the hours you earn by helping out on Saturday, please make sure to sign in and sign out on the volunteer sheet. -- Registration Check In/Check Out stations - there will be a registration box for each of the 10 registration lines (one per each K-8th grade and one for SFB staff/general walkers), with a detailed guideline of how to check in participants before they walk, and how to check out each finishing walker. The guidelines are attached. Please contact us with any questions. -- Lap Counters - new this year is laps will be check marked on the SFB Connects Walk-a-thon t-shirt (with sharpies on the front iPad design). All students and staff have shirts, and some families bought shirts. Those without walk-a-thon shirts will be given the traditional lap card in a lanyard that you will check marked. Registration Check In/Check Out - would like to have 2 people for each of the 10 check in lines but at least 1 person for each will work. Please note that on the day of the walk-a-thon, we may need to distribute volunteers to other needed tasks. We hope that you will be flexible if this situation arises. Thank you! All participants need to check in before the walk-a-thon starts. -- SFB spirit wear will be laid out for sale. 8th Grade will be selling root beer floats and ice cream as part of their graduation fundraising. -- We will have iPads for Square payments so that you can pay by credit card, but please bring checks and/or cash just in case tech fails us on Saturday. Heavy rain originally was forecasted for Saturday. Although the forecast looks better we are watching the weather since it always fluctuates. 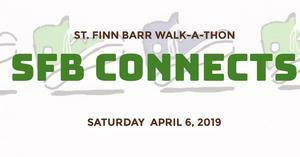 We will send out a confirmation e-mail on Friday, April 5th after 5:00PM to confirm we will continue with SOTA track or to inform you that we will be moving the walk-a-thon indoors to the Parish Hall. Please contact us with any questions. 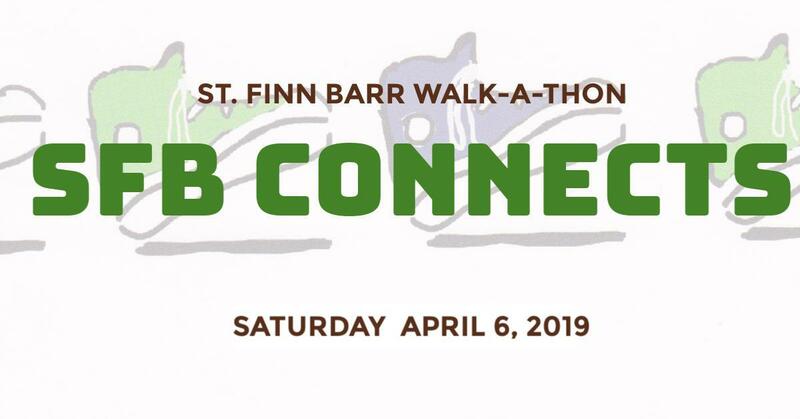 Thank you for supporting SFB Connects Walk-a-thon and SFB!